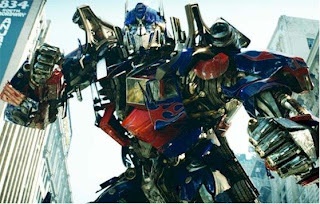 Transformers is more than science fiction like most of the movies we've seen in the Sci-Fi genre which in actuality are more science fact, unknown, unbelievable to most. While the machines and the futuristic robots bring in all the super slick mechanical action between opposing forces of Good & Evil, symbolized by the Autobots who are here to protect Humanity unlike the Decepticons who are in search of 'The Allspark' and would destroy Earth & Humanity to get it. The conflict between the Autobots & the Decepticons affect humanity much like our own psychic wars going on in higher realms which consciousness inhabits. The demons within are let out and the perpetual dualistic conflict is transcended with the Autobots sustaining over the Decepticons and they indeed are destroyed until they make their return in the summer of 2009 with Transformers 2 !